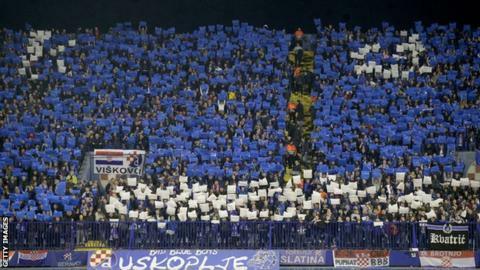 Dinamo Zagreb have been ordered to play their next home European match behind closed doors by Uefa as punishment for racist behaviour by their fans. The racism occurred during Dinamo's 1-0 home win against Benfica in the Europa League on 7 March. Meanwhile, Chelsea have been fined 13,000 euros (£11,086) over the conduct of their supporters in their 2-1 win against Malmo on 14 February. Blues fans threw objects and invaded the pitch during the game in Sweden. Malmo, who lost the last-32 Europa tie 5-1 on aggregate, have been fined €58,000 (£49,468) after their fans set off fireworks and threw objects. In addition to playing a game behind closed doors Dinamo have been also been fined 20,000 euros (£17,063), while a second home match behind closed doors has been deferred for a probationary period of two years. The club will also have to pay 47,000 euros (£40,094) for the setting off of fireworks, throwing objects and blocking stairways. Benfica won the return leg of the last-16 tie 3-0 in Portugal to reach the quarter-finals.